June 25 - With less than three months left to campaign for inclusion on the Olympic core sports programme, the World Baseball Softball Confederation (WBSC) enlisted the help of Olympic softball gold medal-winning Japanese pitcher Yukiko Ueno. She was chosen to spread the word at a game between Yomiuri Giants and Chunichi Dragons in the Nippon Professional Baseball League. 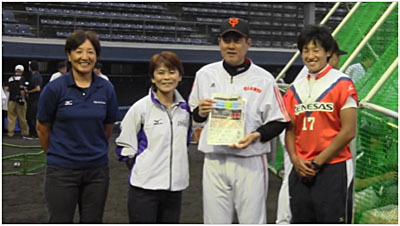 Ueno led her Lenesas Electronics women's softball team along with players from both the Giants and Dragons as they distributed leaflets urging fans to "Swing for the Fences" and get behind the campaign to get the bat-and-ball sports back on the Olympic programme for 2020. The Baseball Federation of Japan have printed half-a-million leaflets to help garner support for the bid, and with Tokyo also bidding to host the Olympic Games in 2020, the dream scenario of a return of baseball and softball to the Olympics in the Japanese capital remains very much a possibility for the WBSC, they hope. Japanese baseball and softball fans are renowned as being among the most passionate in the world, and the nation is considered as one of the sports' main power bases, along with the United states and the Americas. "Baseball and Softball are two of the most popular sports in the world for men and women respectively, and because of the similarities shared by the two sports, the athletes and the fans are very enthusiastic about each other's sports, as well as their own," said WBSC Co-President Riccardo Fraccari. Baseball-softball's joint bid for inclusion back to the Games, which they were controversially ousted from following Beijing 2008, made the shortlist of three sports, along with squash and wrestling, selected by the International Olympic Committee (IOC) Executive Board last month that will do battle for the final spot on the programme. The decision will be made and announced at the 125th IOC Session, which will be held in the Argentinian capital, Buenos Aires, on September 7. "There can be no greater honour for a sport than to be part of the Olympic Games, and we will be trying as hard as we can to realise the dreams of baseball and softball players everywhere - from the champions of the future currently in youth clubs and competitions through to the professional leagues - to participate at the Olympic Games," said Fraccari. Co-President Don Porter added: "Our vision is to work with the IOC to help give every boy and girl the chance to experience the benefits of sport through the unique combination of baseball and softball, which can be played by men and women in all cultures, with rules that allow for uniform modification for religious reasons,"
The leafleting campaign will gain further momentum through presence at the National Inter-city Baseball Championship in July, National High School Baseball Championship in August and other major baseball and softball tournaments as a part of the Playball 2020 campaign by the WBSC.